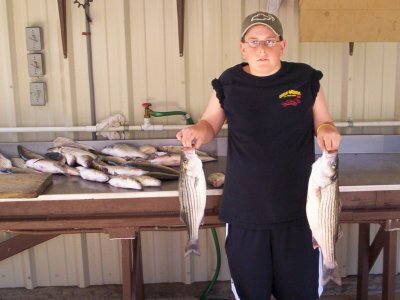 Lake Texoma striper fishing this past 10 days has definately changed for the better. The current lake level is at 620.72 with a water temperature of 63 degrees. We are seeing a lot of seagulls, egrets and blue herrings working bait which makes for easy pickings. As of now I am using live bait (Threadfin Shad) but we have also had some good catches on Sassy Shad lures. Some of the schools of fish I have set up on have been blowing up on the surface. I have mainly been fishing the shallow flats, 15-25 feet of water, but a couple of days I have fished in 70 feet of water with excellent results. With the 70-80 degree days we have had lately, we should start to hammer the stripers in the next 6-8 weeks to come. The last few days I have seen large schools of stripers spreading out to other parts of the lake which is a very good sign. Mornings on Lake Texoma are still very cool so if you are planning on venturing out be sure to dress in layers. Remember you can always shed the layers as needed and stay comfortable while enjoying your time on the water. 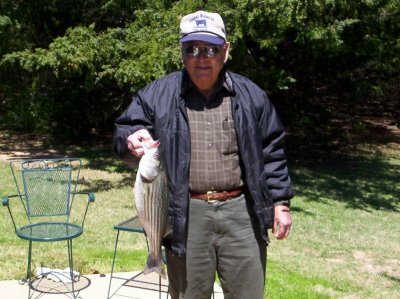 Come on out and striper fishing on Lake Texoma as we are moving into the month of May which is probably our best month for numbers of good sized fish. And as always, be courteous to your fellow fishermen, show a little patience at the ramp and don't forget to get your Lake Texoma Fishing License. Be safe and have a fun day on beautiful Lake Texoma.